Suits - A Business RPG created by Technomancy Studios. - Loooot of dead people here. Ow. The vendor - his name is always BigBuy Clerk, and I should really acknowledge that - is right by the entrance, and he has new equipment for The Guy and Jerome alike. This area is patrolled by Suits, which are weaker than ever, so no worries when exploring. - The Media District consists of five buildings you need to explore. We’ll start with the Music Building, in the southwest. - You can hop in an elevator from the Lobby. It has two destinations: we’ll try the 24th floor first. You can attack a Guard in this room to earn an achievement, and the roaming NPC, BeRich, will attack. He’s not difficult. Vendor BigBuy follows you here, as well. - The 67th floor has a big sound stage. Check the crate just north of the sound stage for $808, then speak to the dude on the stage. Bustin Jiebers, the greatest evil Suits: A Business RPG has ever known. I don't care if he's not the final boss. Horrifying! Bustin is dangerous mainly because he / they can lower your defence and increase his own attack. This results in a bad combination wherein he can hit for close to 300 damage to a single character with his Auto-Tune attack. Ow ow ow. Staple Down is a necessity for a painless battle, but it probably won’t stick as often as you’d like. Have Jerome on healing duty whenever he’s not using Staple Down. You’ll find a Key to Success from besting Bustin. - To the southeast is the Internet Building. This place has three floors: we’ll start on the 2nd. Here you’ll find a slew of Goobtubers. They each have unique attacks, but none of them are really that strong. Killing all six will earn you an achievement. 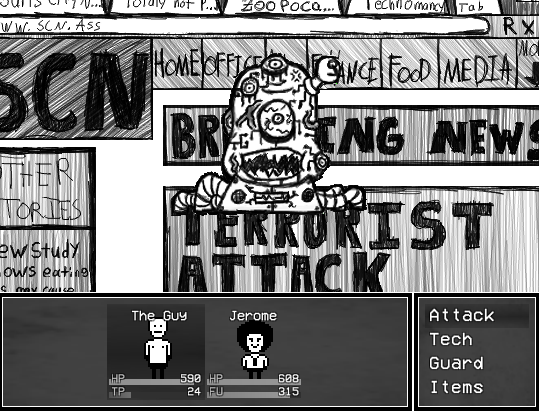 The NPC patrolling the middle of the area will give you six Sandwiches and then promptly die, because… reasons. - The 57th floor has the BigBuy vendor. It also has a computer, and if you check it you’ll be shunted to a virtual space filled with Viruses. They’re all unique - but they’re also all pretty much the same enemy, capable of hitting you and poisoning you. Easy kills. Take down all five for an achievement. Speak to the northern-most NPC to return to the real world. 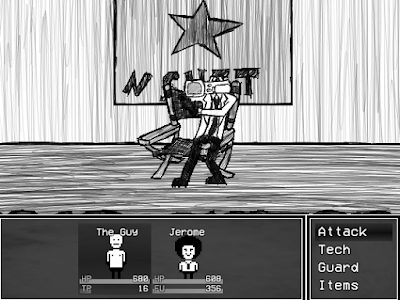 The Internet in Suits: A Business RPG. Uuuuugly. The Internet’s main ‘thing’ is browsing itself, which ups its defence. It will typically do this twice, pushing its defence score high enough that normal attacks will be greatly reduced in effectiveness, if they’re useful at all. It can also poison characters, though it does so seldom, and uses a regular attack of decent potency. Taunt will bring its defence back to manageable levels, and Staple Down will pause it for a few turns if paralysis sticks. Techs in general are good here since they ignore the defence jumps. You’ll get another Key to Success for besting The Internet. - The Video Game Building is in the northwest. The Lobby splits to the west and east; in the west you can find a crack in the wall containing ten Sandwiches, and in the east waits vendor BigBuy. - The elevator from the Lobby leads to three floors. On the 15th floor you’ll find two incredibly weak Peasants, as well as an NPC who will give you $1,000. - On the 23rd floor you’ll find what amounts to the game’s Dev Room. You’ll learn interesting tidbits about Suits here. You’ll also fight several Suits, all pretty danged easy. - On the 57th floor you’ll find a lot of disturbing stuff. Also? Nik Beard! 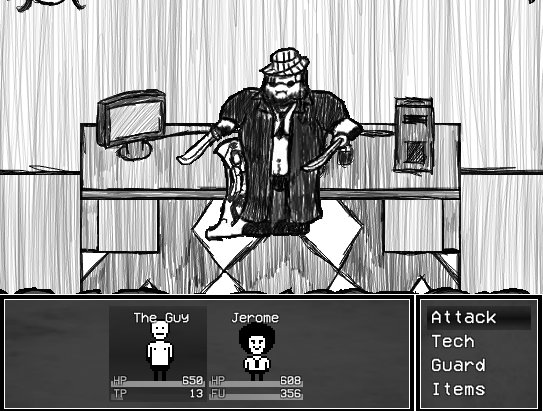 Nik Beard, one of the CEOs in Suits: A Business RPG. Meh. Nik can hit well enough, but he spends the majority of the fight snogging with his body pillow. This increases his defence, making Jerome’s normal attacks pretty much useless. He’ll occasionally tip his fedora to up his attack, but for the most part you’re dealing with manageable attack damage. Put him down with Techs that ignore his defence. It’s a lengthy fight, but not difficult. You’ll gain a Fedora and a Key to Success from Nik Beard, among other things. - The Film Building is the left building is the northeast. Elevator, three floors. Yay! This place is split in half between two buildings, but they link up. We’ll start with the left building. - The 37th floor has a bunch of benign NPCs. If you speak to the eastern-most guy (the one without a shirt) you can deliver a bunch of cheeseburgers from the Food District’s Burger Baron’s in exchange for $3,000. Most of the set pieces here are just that, but you can enter the small shed on the bottom-right to find three familiar dudes. Attack! 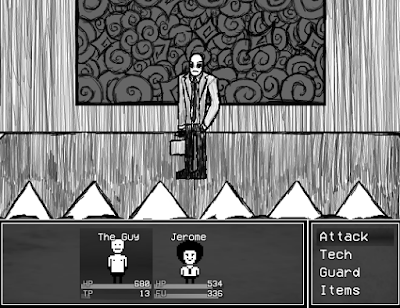 Richard, Jewls, and Bobbles, optional bosses in Suits: A Business RPG. These three are appreciably tough, and unlike other trios they’re separate targets. Richard should be your first target, as he can make one of your characters fall down, essentially paralyzing them for a few turns. Bobbles uses fairly weak attacks and doesn’t do a ton of damage, but can still be a fair nuisance since he can attack twice in a row, so go for him next. Jewls has the most health and can heal himself, but doesn’t hit that hard (until he boosts his attack, anyway), so you can save him for last. A few Staple Storms go a long way in this fight. 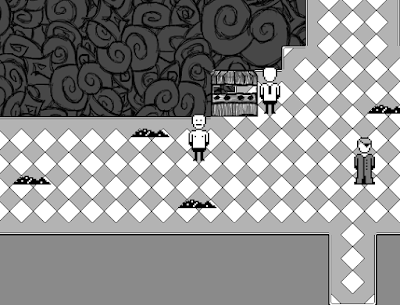 - The 80th floor has a single NPC. Battle! Irritating! The Cameraman has three attacks. One hits a single person, one hits both characters, and the last, not used too often, paralyzes you. Despite his lithe appearance Cameraman has a lot of health, and the all-hitting attack can chip away at you pretty quickly, so hard-hitting Tech attacks combined with Taunt is recommended. 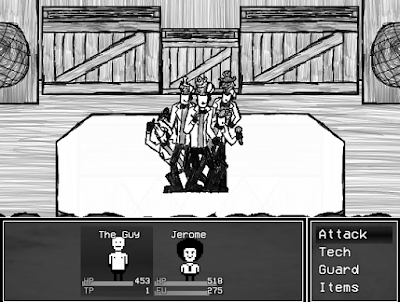 Staple Down can paralyze him, but it doesn’t seem to stick very often at all, so Jerome might be better served on healing duty. Cameraman drops a Key to Success when defeated. - The left building covers the majority of the Film and Television Building. Check the 80th floor of the right building, though, and you’ll find an extra battle waiting - assuming you don’t like a certain show. (All Shell Dan does is bite weakly and increase his defence, though, so he’s pretty weak. Hardly a boss.) You’ll get an achievement and a note about the Cameraman. Shrug. - Collecting the three Keys to Success creates a bridge in the north to the final location, the Central Media Tower. Head north and, as you pass between two statues, you’ll get into a battle. Capitalism and Corporation have plenty of health, but they don’t do nearly enough damage to be much of a problem. They also drop a lot of stuff, namely Reva-Rivas and Spectacular Sandwiches. - The Lobby’s ahead. The final save of the game is in here, as well as BigBuy’s final vending stand. Save up and purchase whatever you think you’ll need to survive - there’s no need to horde money anymore, so you might as well fill up your stock of healing items - then hop on the elevator. The final boss awaits! 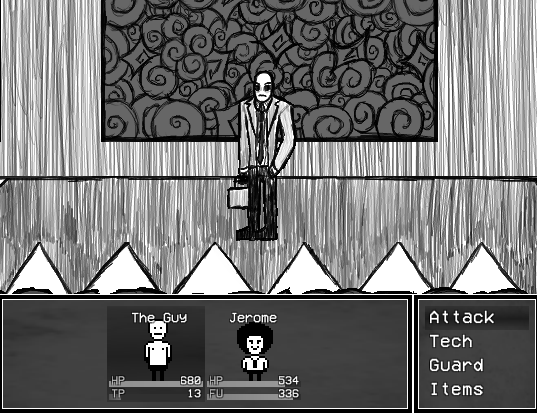 The CEO, your ultimate nemesis in Suits: A Business RPG. He won't go down easily. Befitting a final boss, The CEO is pretty damned tough. 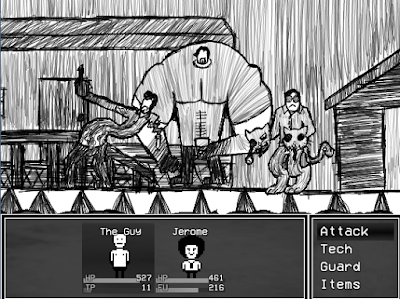 Similar to the Pile of Bodies, The CEO can and will corrupt you, lowering your stats across the board and making one or more characters incredibly weak for a few rounds. This coupled with a strong suitcase attack can quickly take down The Guy or Jerome in short order if you’re not careful. Nevertheless, The CEO has the same weakness as most enemies in this game, and that’s paralysis. Use Staple Down whenever you can to paralyze him, use the halt in attacks to heal up, and smack him around with The Guy’s Tech attacks. He has lots of health, but The CEO doesn’t take that long to bring down, so long as you’ve been levelling consistently and buying new equipment. Once he goes down, congrats! Game over! Enjoy the ending, and your new achievement! The small shed is locked for me. What I did wrong?